I love seafood however I will totally admit I have only cooked with shrimp a few times my entire life. Something about it just has always scared me. So while picking up some salmon (my favorite) last week I grabbed a bag of scrimp too. I was ready, ready to try something different and fresh and I believe I totally accomplished that with this dish. It was FAST & EASY but my favorite was it being fast. I believe it only took about 20 minutes to cook from beginning to end. Your gonna need to get some onion & garlic started in a pan with half a stick of butter. Let that cook for about 2 minutes then your gonna put in your shrimp. I used peeled & deveined shrimp but they did have a tail the first time but the second time I cooked this I found peeled, deveined and no tail. Next, I added a little EVOO and juice from 3 lemons. Salt and pepper and let it cook for just about 2/3 minutes and I covered and removed from the heat. Now your gonna need boiling water to add some angel hair pasta too! As soon as those 8ish minutes are done get the noodles and place into the shrimp! I stirred it all around and topped with Parsley and Parmesan - Can you say YUM? My children and husband absolutely loved this dish. 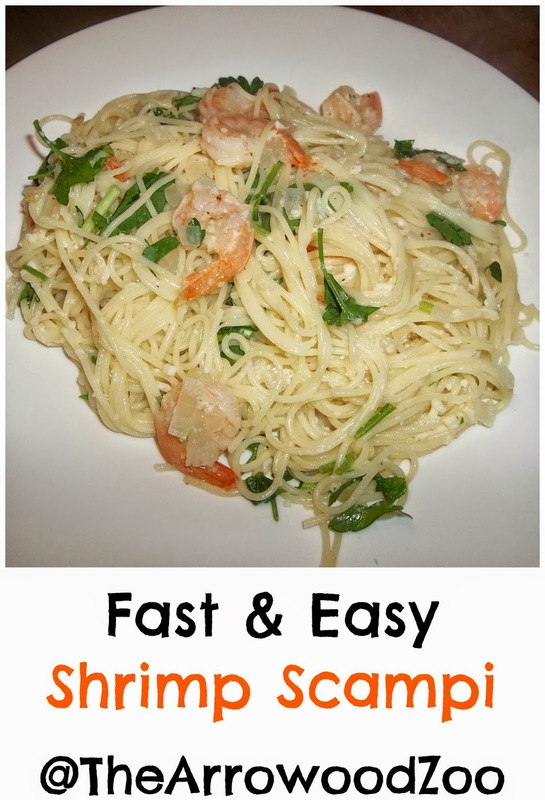 It was a very light but filling dish and I loved that it was so easy and fast for my busy days.